Good Monday to you all! I hope you're having a great day! I planted some of my veggie and flower seeds last week (in my house). It's so rewarding to actually see them popping out of the soil! I dear friend gave me two high-bush blueberry plants and those also got planted into my garden today. I LOVE blueberries and after eating some off her plants last fall, I decided that this is what I wanted! They were so yummy! Can't wait for mine to produce blueberries! I'm always anxious to eat all the fruits and veggies out of my garden! This is actually when I eat the healthiest! The "fruits of my labor." keep the patch going strong. For years I traveled 1 1/2 hours to a strawberry farm to pick and freeze them. So, to be able to walk into my own garden and pick strawberries is wonderful! Man, do we love eating my strawberry rhubarb muffins! Here is my layout for today. Pieces of paper and cardstock were cut into strips and folded in half and the ends were cut slanted. They were stapled along the end of the journaling block. The ribbon was gathered at one end with a needle and thread. Two buttons were layered and this covered the end of the ribbon. A piece of black ribbon was threaded through the yellow button and knotted. tucked inside the knot so it wouldn't show. Have a great day and thanks for taking a look at my Blog! Here's a close up of this flower grouping. A lace paper doily was lightly inked then placed under my flowers. The brown flower was hand cut, layered and sanded lights along the edges. For the center of the flower, I hand cut a smaller flower and hot glued the edges of each petal so that it made something like a "cup." Then a satin covered button was added in the center. The small blue rosette is made with seam binding. I just threaded one edge and gathered it to form this cute little flower. The leaves were hand cut, folded in half one way, sanded in the center and along the edges, then folded the other way and pinched at the edge to resemble a leaf. The light blue and tan flower was made from a lei necklace that was purchased at a Dollar Store (the bottom flower), the tan and light blue flower are Prima flowers. I found some wire ribbon that actually matched my layout! I knew I wanted to use it on my layout but couldn't figure out what to do with it, so I wrapped it around a pencil and cut it into strips and placed it randomly by the flowers. What do you think? the button makes it look so cute! with a button for the center. Leaves and wire ribbon were placed around the flower. Have a wonderful day and thanks so much for checking out my Blog! A late post, but it will be worth it. This is the first time I've worked with sheet metal on a layout and I love it! Easy to use and I especially love the color! I only wish I had more!! This is my prized layout. Hope you like it as much as I had fun putting it together. Here's a close up of the embossed sheet metal. on top of the chipboard and added a gem brad for the center. Pretty neat using the different embossing folders! I think it added a nice affect on this layout. I used the Nestabilities Die for the journaling (or title block) and added a bow. Yes, I'm addicted to scrapbook layouts. I can't help it. 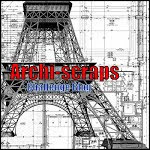 I figure that if I can make THOUSANDS of layouts then I might have enough to scrap all my photos! And all I would have to do is add photos and a title. Pretty cool. Sometimes (only sometimes) I wonder if I'll ever use all these layouts..... wait! Yes, I will because I have way too many photos to scrap! What else would I do with all my photos? Oh sure, I could just throw them all in a photo album, but that would be way too easy. Besides, I enjoy the paper too much!! Here's my layout for today. Are these buttons just the cutest? Love them as the center for my flowers. I hand cut the flowers and leaves. 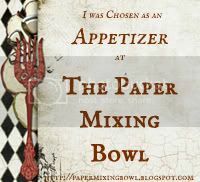 Then I layered several, scrunched and pinched and manipulated the paper until finally I got them the way wanted. The flowers are "lifted" off the page because of the buttons. I decided not to remove the bottom part of the button and really like how they look suspended off the page. The flower without the button is just four folded flowers. I folded the flower in half, then in half again and glued four of them together on a small cardstock circle. I then scrunched them and lifted them up to create the flower. Easy and fun! 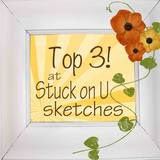 Have a wonderful day and thanks bunches for checking out my Blog! How is your day going so far? Less than stellar? Well, this layout should brighten up your day! Just take a look at it. Well..... doesn't it? If you're still staying, "No," then I'm not sure what else to say. But I do hope you find "something" good about your day, something to be thankful for. Smile a little, laugh a lot and see what happens. I used two different shapes of flowers, layering a couple of them and using a different one for the center, curling up the edges. Rather than put something in the center (beads, a paper circle, another scrunched up flower) I decided to leave it as is. I curled the edges more around the flower below, which serves as the center of this flower. I did take a close up, but not showing it. And here's the reason why.... you can see my pencil marks where I traced a flower.... and I forgot to erase the marks. I have to remember to go back and erase that! Smile, laugh and have a wonderful day! Hope you're all having a wonderful Wednesday! I plan on doing some crafting today, before the "storm of life" hits! 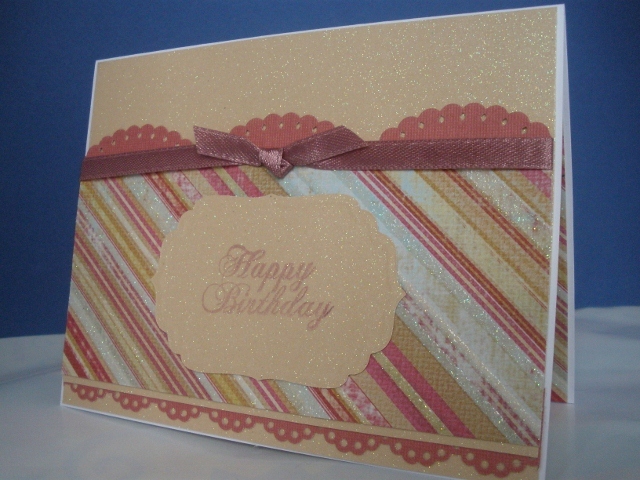 Thought I'd treat you nicely to a beautiful glittery Birthday card. Another gloomy day here. Maybe this card will brighten your day. Sentiment: Inkadinkadoo, Ink: Adirondack Purple Twilight, gem, Big Shot, Sizzix. Fun card to make, using several techniques. 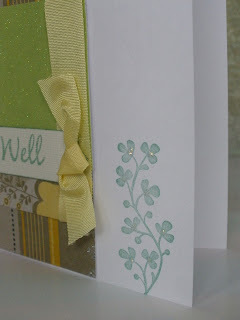 I almost forgot how pretty embossing is on a card! 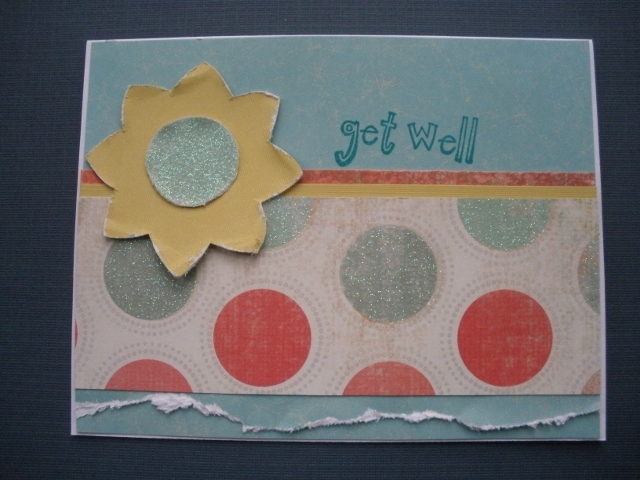 And, I am having so much fun using my Nestabilities dies. I definitely need more of those! Everything's Better With Butter On It!! A very rainy day calls for some sort of comfort food, so I made a batch of blueberry muffins today. Don't know about you, but I have to smother my muffins with butter before eating them. I also made some homemade mac and cheese.... which I cannot eat. But my hubby and grandson can. Don't get me wrong, I would LOVE to eat it, but the migraine I would get just isn't worth it! Yes, I have food allergies. Anyone else have food allergies? They're no fun, that's for sure! And migraines every day were no fun either! I suffered with migraines for years and they kept getting worse each year. Every prescription drug I tried just dulled the pain, wouldn't work at all or I had too many side affects from them. My opinion on all these drugs: They were just masking the problem! After a round at the ER (in which I was determined would be my LAST) and tons of drugs to kill the migraine, a list of foods to avoid was given to me and I figured I'd better do something! The secret migraine-causing stuff is called Tyramine. Who would've ever thought it was FOOD!! And I was eating these foods EVERY DAY! Chocolate, all cheeses (except Cottage cheese(yuck) and Cream cheese (yum), all smoked meats (ham, pepperoni, sausage), deli meats, raisins, yogurt, A-1 Sauce, Worcestershire Sauce, BBQ Sauces, avocados, smoked fish, bananas, figs and mushrooms. OK, not much going on here today so I seized the opportunity to create some cards... after I did the laundry, dishes and cooked (ugh)! I used the same layout for both but with different sentiments. Have a wonderful day and thanks for checking out my Blog! 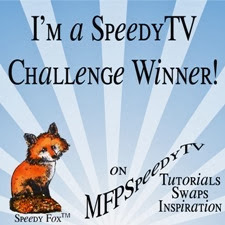 No creative post today, but I do have information about a great giveaway! And, no, it isn't my giveaway. 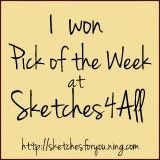 This is where I entered to win some Blog candy! Would be so exciting to be the winner of this fun stuff! 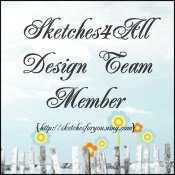 If you would like to enter just click on the link above and follow this Blogger's instructions. Have a great Sunday and thanks for taking a peek at my Blog! 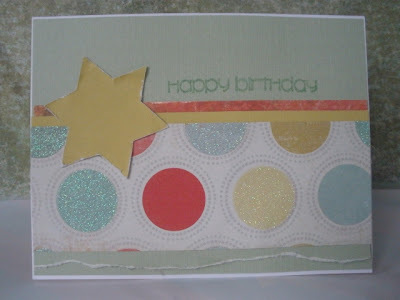 Going Wild Over DCWV Glitter Paper Packs! Here's a couple cards for today. I tried to get a close up of the Stickles on the flower, but you can barely see it. Love how this card turned out. I think I may case my own card again in the future! Have a wonderful day and thanks for looking at my Blog! I've been working on a few cards and hope you like them. Pink and brown are not colors I generally put together but they do match well. 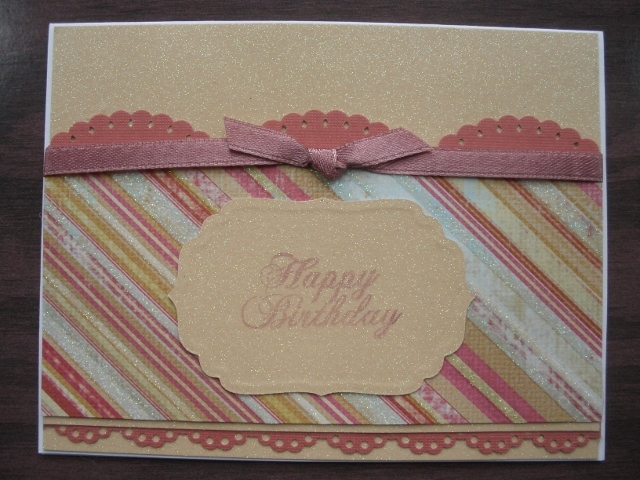 I love it when cards come together quickly, instead of days trying to figure out a layout and still have it look good! Cards that are on my desk for too long most usually don't come together the way I want and end up being a card I won't use. These cards make their way to the back of my card stash! 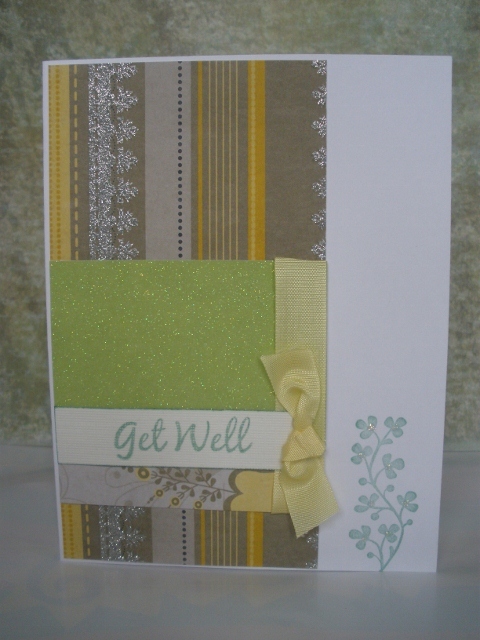 Paper: DCWV, White cardstock: ColorBok, white thread, Stamp (unknown), Nestabilities Labels Die, Stamp, Ink: Vivid! Raspberry, pink ribbon, Big Shot. I'm always in need of Birthday cards! Tried something different by putting "other shapes" on my cards. It took me awhile to pick what I thought would look good. I overlapped two hearts to give some dimension. I sanded the edges of the flower and bent the petals up slightly. I hand cut the center of the flower, sanded and inked the edges. I lightly inked all the edges of the card. Ink: Ink It Up! 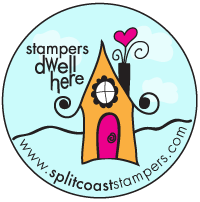 Violet, sanding block, Stamp: Stampin' Up! Hugs & Wishes. 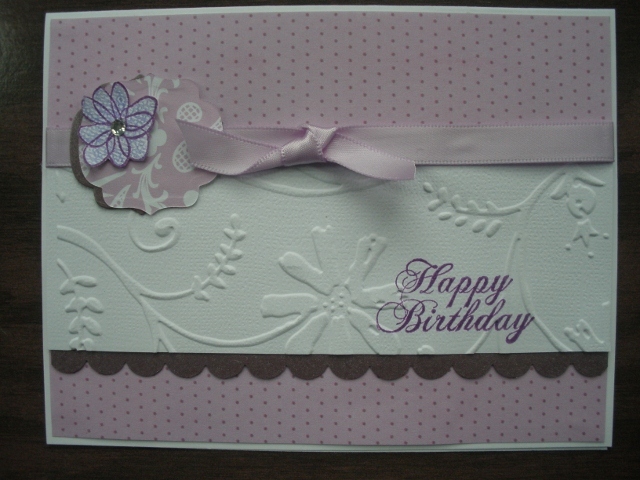 I worked on this paper doily for awhile, trying to figure out how I wanted it on this card. In the end I cut it in half and inked it. I hand cut the flower, layered two of them and inked the edges. 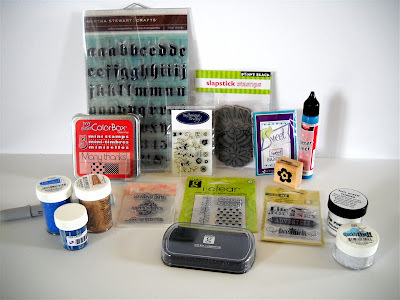 Sentiment: Fiskars Clear Stamps, Ink: Ink It Up! Violet, white thread, sanding block, Big Shot. discount store for $.50 per spool and looks so elegant! I may have to pick up more of these! 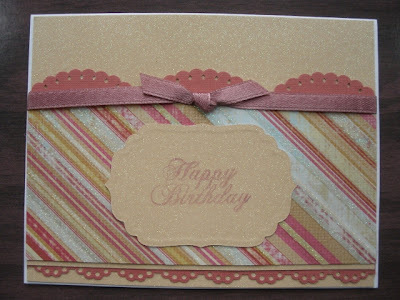 Paper: DCWV, White cardstock: ColorBok, colored pencils, ribbon, Ink: Color Box Creamy Brown and A la mode Red, Stampin' Up Happy Everything and A Flower for All Seasons. Have a wonderful weekend and thanks for checking out my Blog! I have lots to post! Can't wait to show you what I've been working on! Since "Blogger/Google" is having "issues" with Spam, I won't be posting anything on my Blog until this most annoying thing gets resolved. I've since realized that other Bloggers are having the same issues. If you know of a way to stop this Spam/virus, PLEASE pass your info. on to me. I would truly appreciate it! What is up with that anyways? Don't people have better things to do than spread spam and viruses? Why bother innocent people who are trying to enjoy a hobby? If I have to delete my Blog, then that's what I'll do! But then that means that "they" win, and that just doesn't set well with me! I'm very persistent too....... so we'll see what happens. I hope my followers still stay my followers. Please be patient (because I cannot be) and stay with me. Are You Ready for Pink and Brown? My layout for today is pinks and browns. Supplies used: DCWV, White cardstock: ColorBok, satin pink ribbon, coffee filters, lace fabric, tissue paper, sheer fabric, wallpaper flower, gold brads, Sizzix flower die, Big Shot. This flower was made with tissue paper, sheer fabric, wallpaper, coffee filters and lace fabric. The flowers were cut using my Big Shot. I layered the different sizes and scrunched them. The satin ribbon was wrapped around each corner. This look is so cool! Love how it turned out. 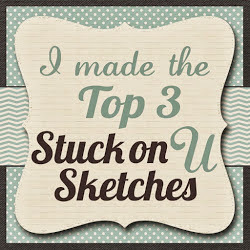 Usually I add lines to the journaling block. This time I didn't, so journaling can be done however I choose. This flower was made with wallpaper sample books that were given to me. I used my Sizzix flower die to cut everything out with my Big Shot. The flower was also made with sheer fabric, lace fabric and tissue paper. I layered the different sizes until I got the look I wanted and held them together with a gold brad.